What’s old is new again…in the hands of Keefe Duhon and his crew from Concrete Revolution of New Iberia, Louisiana. When a six decades old barn was being converted into a daycare, the concrete floor, layered with dirt, oil, and grime that comes with years of hard use, was in dire need of cleaning, repair, and a new look. A wood floor was chosen to blend with the overall décor. 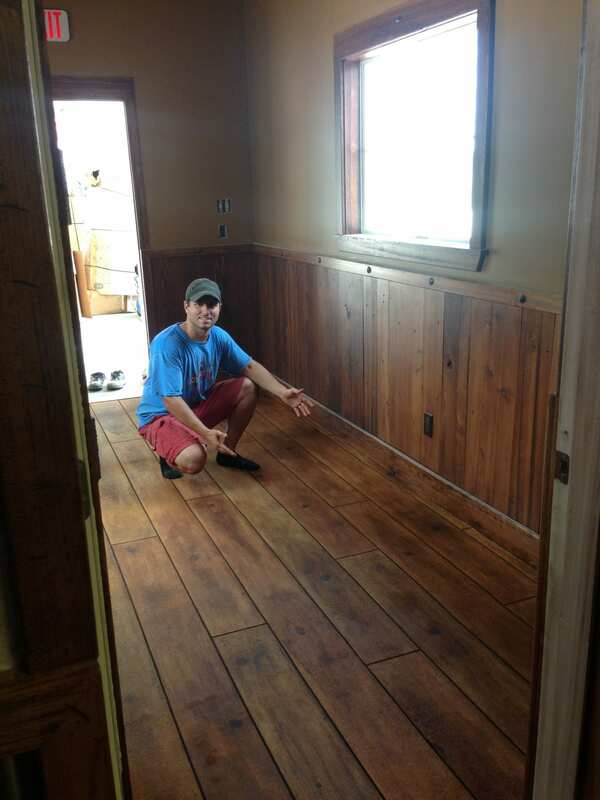 The eco-friendly choice was made to utilize the existing floor and transform it to have the look of wood planks. The Concrete Revolution team was ready to tackle this project with the use of many of SurCrete Design Products specialized concrete treatments. The five day process started with the prep of the Louisiana concrete floor. First, SureCrete’s Super Concrete Renovator (SCR) was used to thoroughly clean the concrete and Elasto-Shield, a liquid application that provides waterproofing and crack prevention, was used to fill in cracks. Next, a base-coat of jet black colored SureSpray was magic troweled onto the surface of the fully prepped concrete. Micro tape was used to outline each plank followed by a micro-spraying of uncolored Sure Spray for the topcoat. 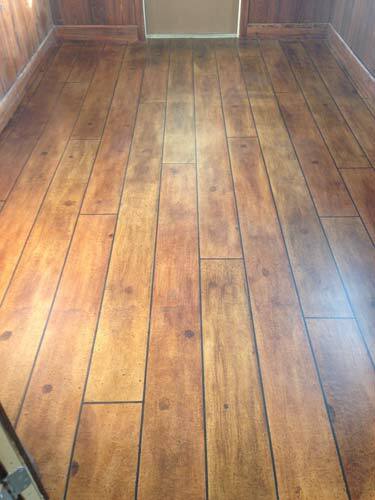 Then, after the tape was pulled, each plank was hand-stained with various shades of Eco-Stain for a truly authentic appearance. 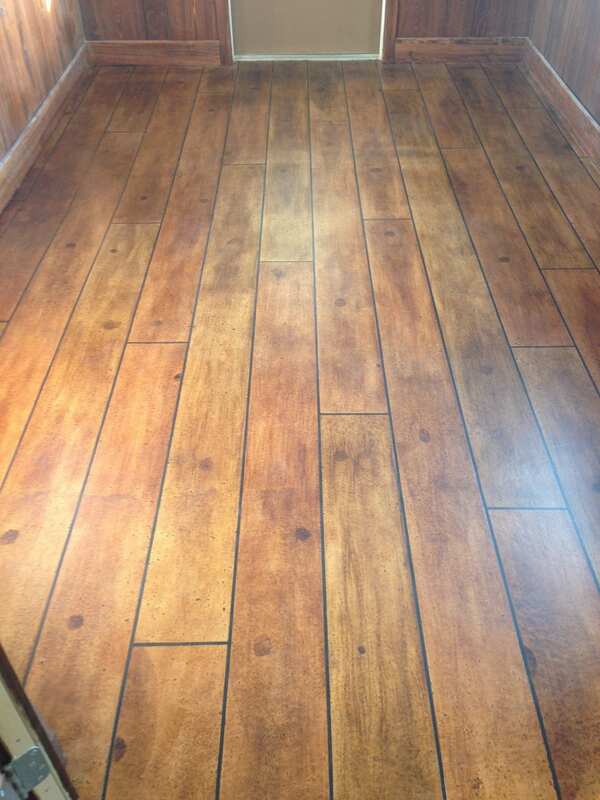 Finally, the new “wood” floor was sealed with a coat of SureCrete’s low VOC Dura-Kote Epoxy and followed with commercial grade, low VOC Dura-Kote Water Based Polyurethane for a durable satin finish. The look of wood with all the advantages of concrete…who knew?